Intraday bias in USD/CHF remains on the downside at this point. 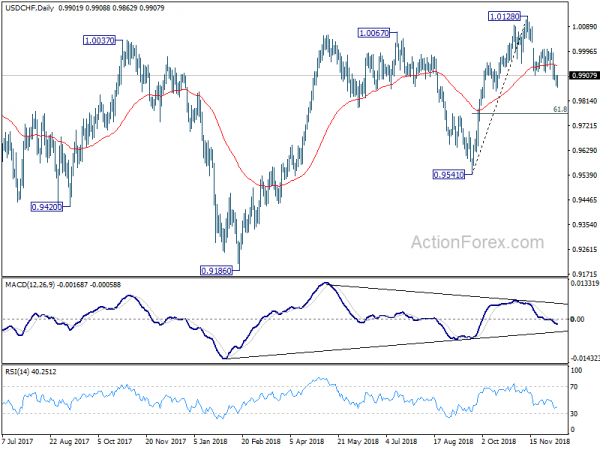 Current fall from 1.0342 should target target 0.9443 key support level next. At this point, we’d expect strong support from there to bring rebound. On the upside, break of 0.9699 resistance is needed to confirm short term bottoming. Otherwise, outlook will remain bearish in case of recovery. In the bigger picture, USD/CHF is still bounded in medium term range of 0.9443/1.0342 for the moment. Consolidative trading would likely continue and medium term outlook remains neutral. Break of 1.0342 key resistance is needed to confirm underlying bullish momentum in the pair. Meanwhile, downside attempts should be contained by 0.9443 key support level. However, sustained break of 0.9443 will carry larger bearish implication and target 0.9 handle. Daily Pivots: (S1) 0.9535; (P) 0.9559; (R1) 0.9590; More…. Intraday bias in USD/CHF remains neutral for the moment. On the downside, firm break of 0.9527 minor support will turn bias to the downside for retesting 0.9427 first. Break of 0.9427 will resume whole decline from 1.3042. Meanwhile, considering it’s close to to 0.9443 key support, consolidation from 0.9427 might extend further. But still, break of 0.9772 resistance is needed to confirm near term reversal. Otherwise, outlook stays bearish for another decline. 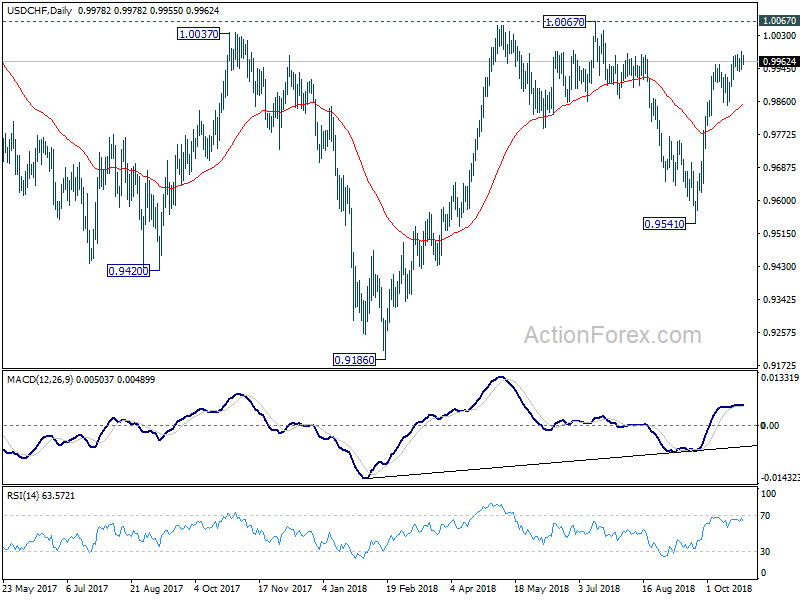 In the bigger picture, current development suggests that 0.9443 key support (2016 low) could be taken out firmly as down trend form 1.0342 extends. There are various interpretation of the price actions. But in any case, medium term outlook will stay bearish as long as 0.9772 resistance holds. 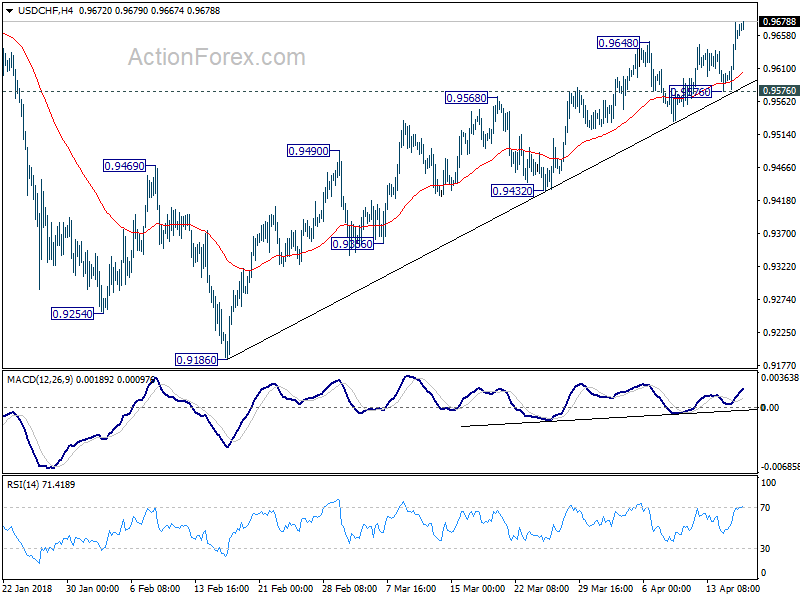 Current down trend could extend to 38.2% retracement of 0.7065 (2011 low) to 1.0342 (2016 high) at 0.9090. However, break of 0.9772 will indicate that USD/CHF has successfully defended 0.9443 again and turn outlook bullish for 1.0099 resistance. A temporary low is formed at 0.9862 with today’s recovery. Intraday bias in USD/CHF is turned neutral first. On the downside, below 0.9862 will target 0.9848 support first. 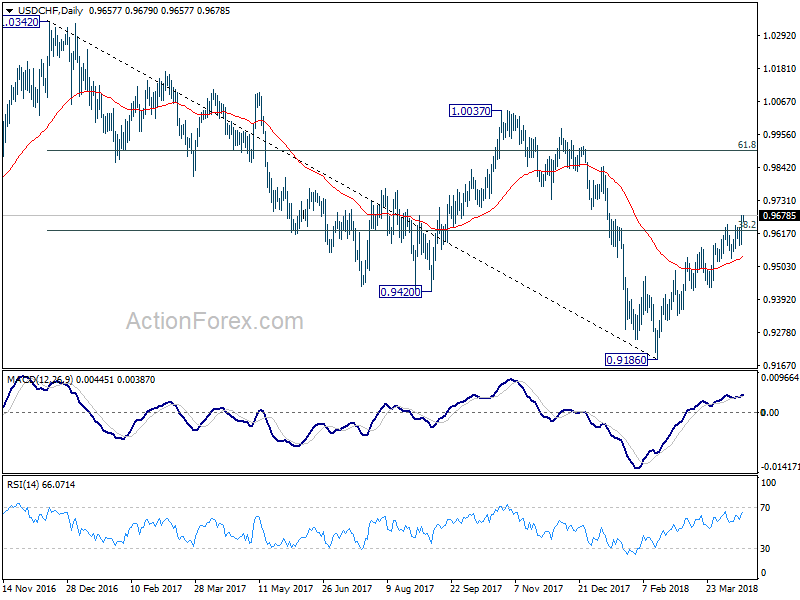 Sustained break there will confirm near term reversal and target 61.8% retracement of 0.9541 to 1.0128 at 0.9765 and below. On the upside, break of 1.0008 resistance will indicate that the pull back from 1.0128 has completed and bring retest of this high. Daily Pivots: (S1) 0.9881; (P) 0.9913; (R1) 0.9946; More…..
With 1.0002 minor resistance intact, deeper decline is still expected in USD/CHF for 0.9860 support. 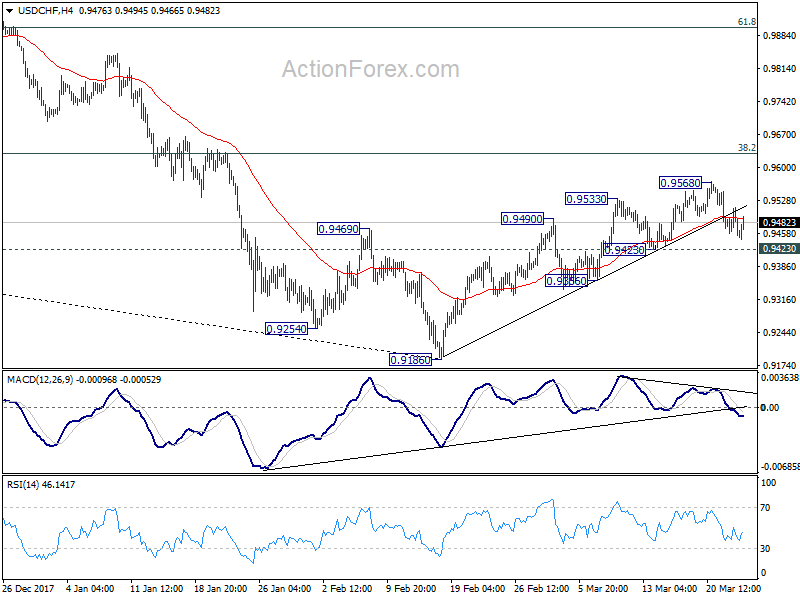 Break there will resume whole decline from 1.0342 and target 100% projection of 1.0342 to 0.9860 from 1.0169 at 0.9687. Nonetheless, on the upside, break of 1.0002 minor resistance will turn bias back to the upside for 1.0169 resistance instead. 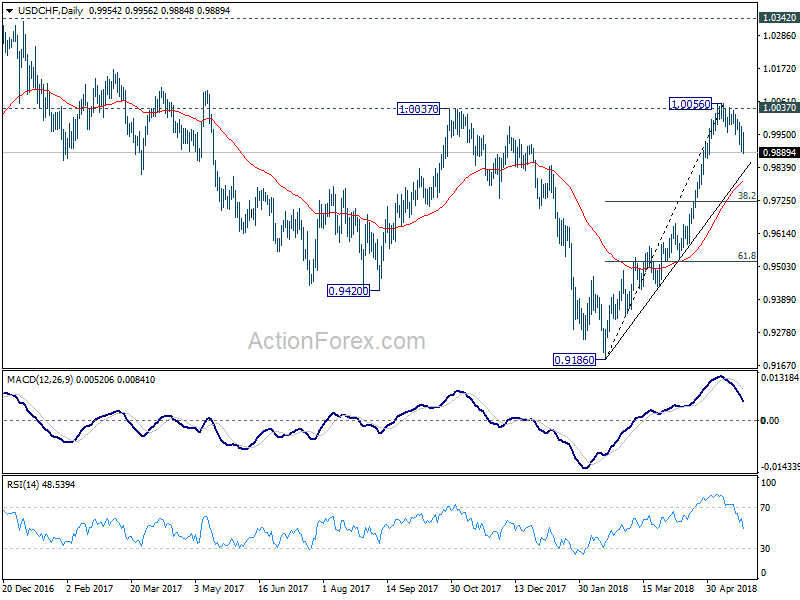 In the bigger picture, USD/CHF is staying in medium term sideway pattern between 0.9443/1.0342. In any case, decisive break of 1.0342 resistance is needed to confirm underlying strength. Otherwise, we’ll stay neutral in the pair first. In case of another fall, we’d expect strong support from 0.9443/9548 support zone. 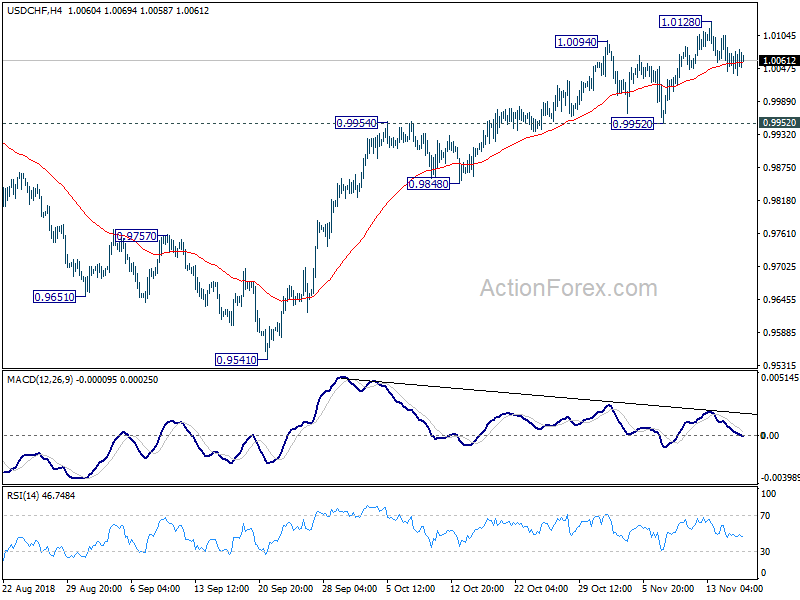 USD/CHF is staying in consolidation from 1.0128 temporary top and intraday bias remains neutral. 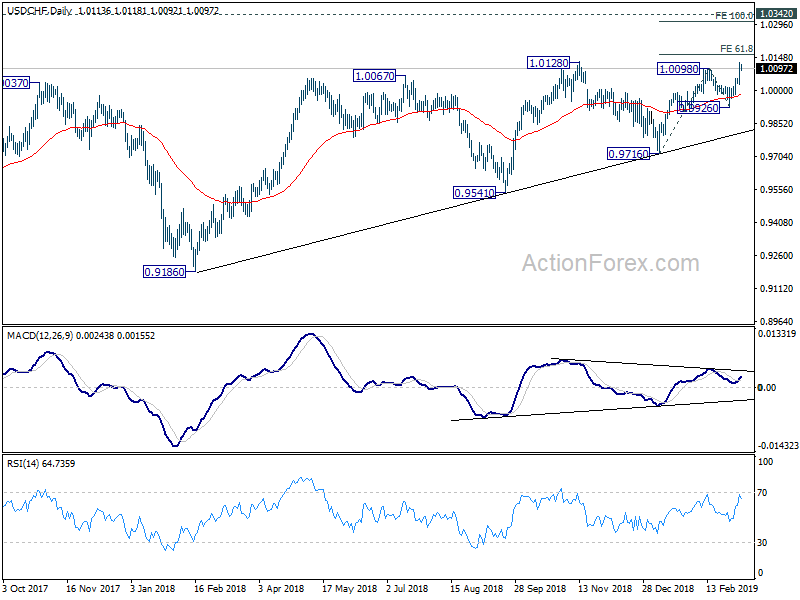 As long as 0.9952 support holds, near term outlook remains bullish for another rise. On the upside, break of 1.0128 would resume larger rise from 0.9186 and target 1.0342 key resistance. However, firm break of 0.9952 will indicate short term topping and bring deeper fall back to 0.9848 support first. 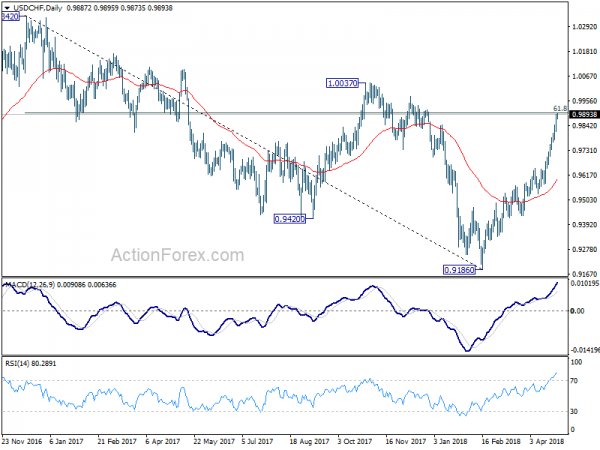 USD/CHF’s rally resumed by taking out 0.9980. While upside momentum remains unconvincing as seen in 4 hour MACD, intraday bias stays on the upside for 1.0067 key resistance next. On the downside, below 0.9937 will turn intraday bias neutral again. 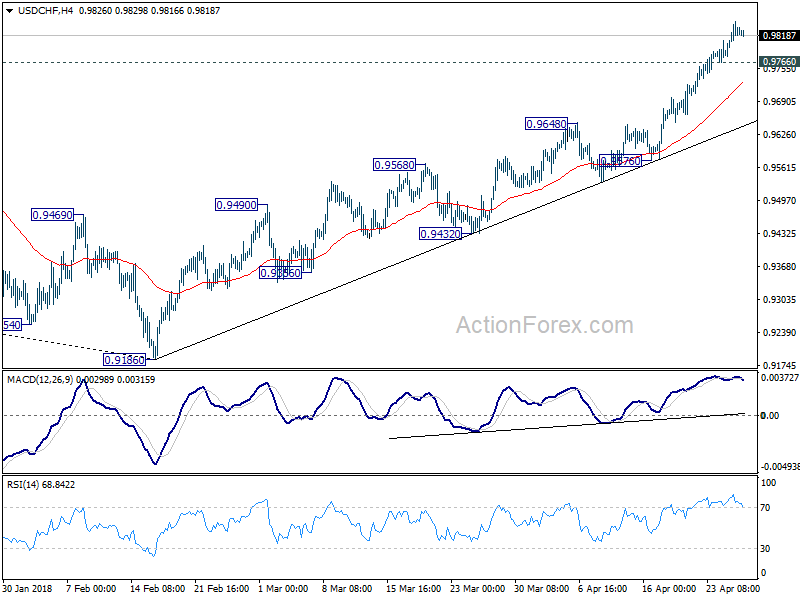 Also, considering bearish divergence condition in 4 hour MACD, break of 0.9848 support will indicate reversal and turn outlook bearish. In the bigger picture, the pullback from 1.0067 has completed at 0.9541 already. And rise from 0.9186 is likely resuming. Firm break of 1.0067 will pave the way to retest 1.0342 key resistance. We’d be cautious on strong resistance from there to limit upside to bring another medium term fall to extend long term range trading. Daily Pivots: (S1) 1.0059; (P) 1.0077; (R1) 1.0105; More….. Intraday bias in USD/CHF remains on the upside for the moment. Current rise from 0.9858 should target 1.0107 resistance next. As noted before, correction from 1.0342 should have completed at 0.9812. Break of 1.0107 should pave the way to retest 1.0342 high. On the downside, below 1.0048 minor support will turn bias neutral and bring consolidation first before staging another rise. In the bigger picture, we’re still maintaining that firm break of 1.0342 key resistance is needed to confirm underlying bullish momentum in the pair. However, the corrective nature of the fall from 1.0342 is starting to give the medium term outlook a bullish favor. Hence, in stead of looking for topping signal around 1.0342, we’d now pay closer attention to upside acceleration as USD/CHF approaches this level again. 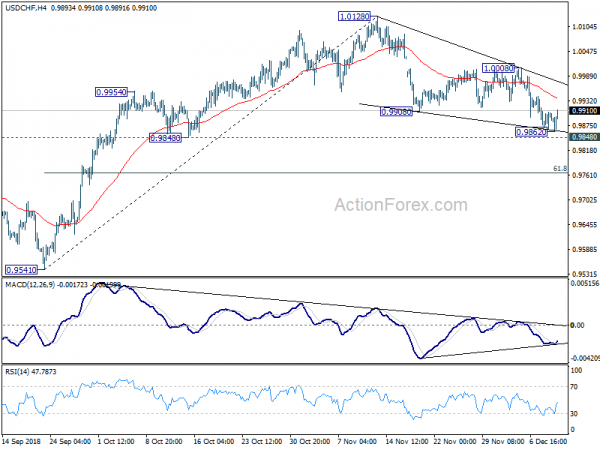 USD/CHF is losing some upside momentum as seen in 4 hour MACD. But intraday bias remains on the upside with 0.9766 minor support intact. Current rise from 0.9186 is still in progress for 0.9900 fibonacci level first. Break will target 1.0037 resistance next. On the downside, below 0.9766 minor support will turn bias neutral and bring consolidations. But outlook will stay bullish as long as 0.9576 support holds. 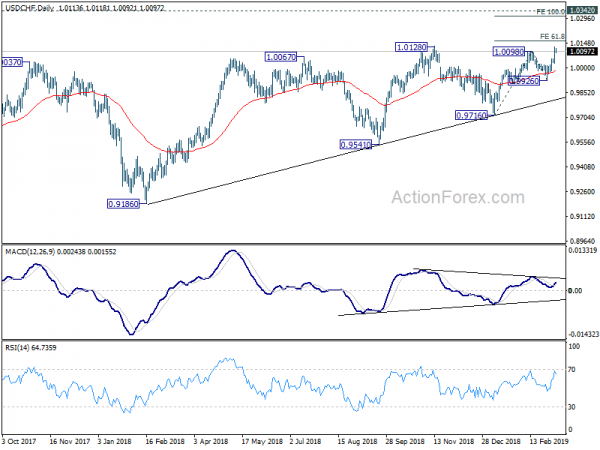 In the bigger picture, fall from 1.0342 is seen as a medium term down trend. The break of 38.2% retracement of 1.0342 (2016 high) to 0.9186 (2018 low) at 0.9626 suggests that it’s likely completed at 0.9186 already. Further rally would be seen back to 61.8% retracement at 0.9900 and above. Sustained break there would pave the way to retest 1.0342 key resistance next. This will now be the preferred case as long as 0.9576 support holds. Daily Pivots: (S1) 0.9806; (P) 0.9844; (R1) 0.9872; More…. 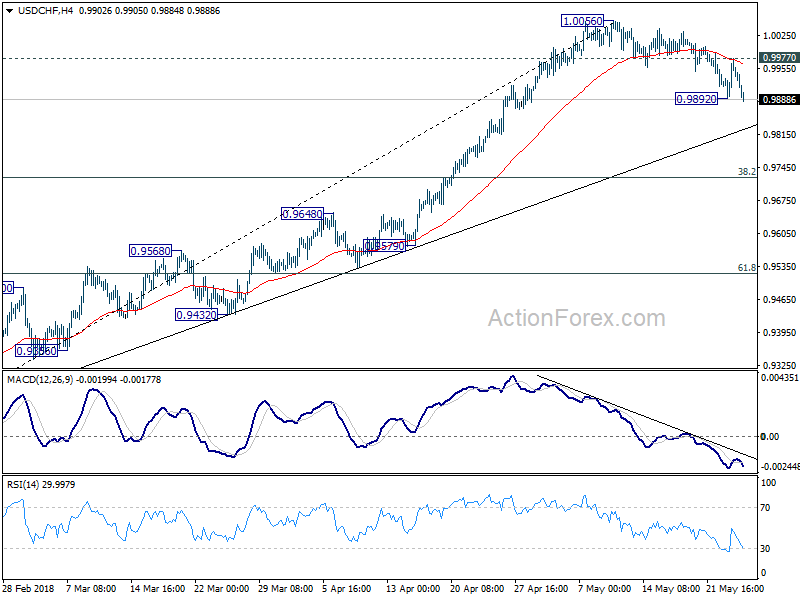 Intraday bias in USD/CHF remains neutral as recovery from 0.9776 is limited well below 0.9446 resistance. 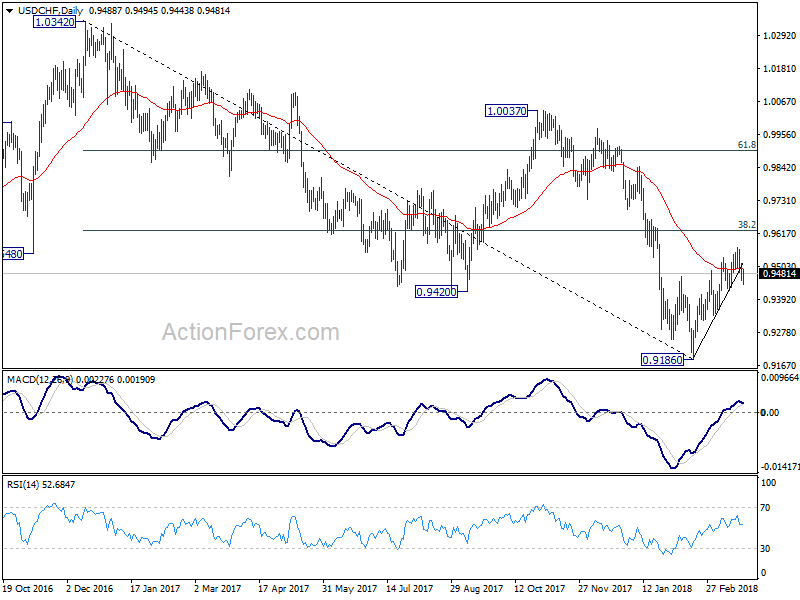 Another fall is in favor and break of 0.9776 will target 61.8% retracement of 0.9420 to 1.0037 at 0.9656. We’ll look for bottoming again below 0.9656 and above 0.9420. On the upside, break of 0.9946 resistance will indicate that the decline from 1.0037 has completed and bring retest of this resistance. In the bigger picture, range trading continues between 0.9420/1.0342. At this point, 0.9420 appears to be a strong support level. Therefore, in case of decline attempt, we don’t expect a firm break of this level. Nonetheless, strong break of 1.0342 is also needed to confirm upside momentum. Otherwise, medium term outlook will stay neutral. Daily Pivots: (S1) 0.9551; (P) 0.9592; (R1) 0.9618; More…. At this point, USD/CHF is staying above 0.9535 temporary low and intraday bias remains neutral. Outlook stays bearish as long as 0.9689 support turned resistance holds. Break of 0.9535 will resume the decline from 1.0037 and target a test on 0.9420 low. Nonetheless, firm break of 0.9698 will be the first sign of near term reversal. And, intraday bias will be turned back to the upside for 0.9844 resistance for confirmation. Daily Pivots: (S1) 0.9818; (P) 0.9844; (R1) 0.9869; More…. No change in USD/CHF’s outlook as it’s staying in range of 0.9423/9568. Intraday bias remains neutral. As noted before, rebound from 0.9186 could still extend higher. But considering bearish divergence condition in 4 hour MACD, upside should be limited by 0.9626 key fibonacci level, to complete the rebound from 0.9186. Break of 0.9432 support will indicate near term reversal and turn bias to the downside for retesting 0.9186 low. Nonetheless, sustained break of 0.9626 will carry larger bullish implications. In the bigger picture, fall from 1.0342 is seen as a medium term down trend. Current development is raising the chance that it is completed. But there is no confirmation yet. Focus will now be back on 38.2% retracement of 1.0342 (2016 high) to 0.9186 (2018 low) at 0.9626. 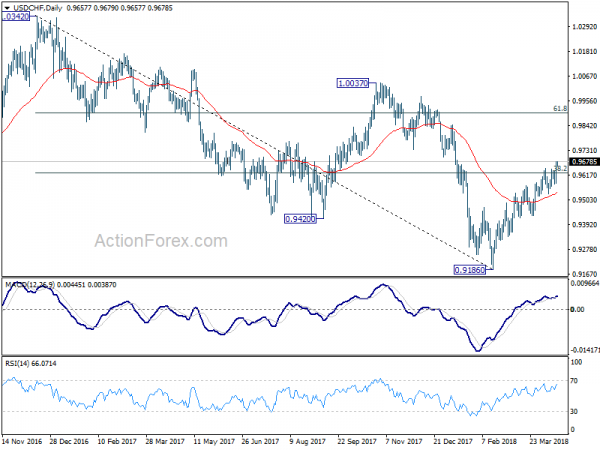 Sustained break there will add much credence to the case of trend reversal and target 61.8% retracement at 0.9900 and above. However, rejection from 0.9626 will maintain medium term bearishness for another low below 0.9186. USD/CHF’s rally extends to as high as 0.9895 so far and intraday bias remains on the upside. Break of 0.9900 medium term fibonacci level will target 1.0037 resistance next. On the downside, below 0.9815 minor support will turn bias neutral and bring consolidations. But downside of retreat should be contained above 0.9648 resistance turned support to bring another rise. 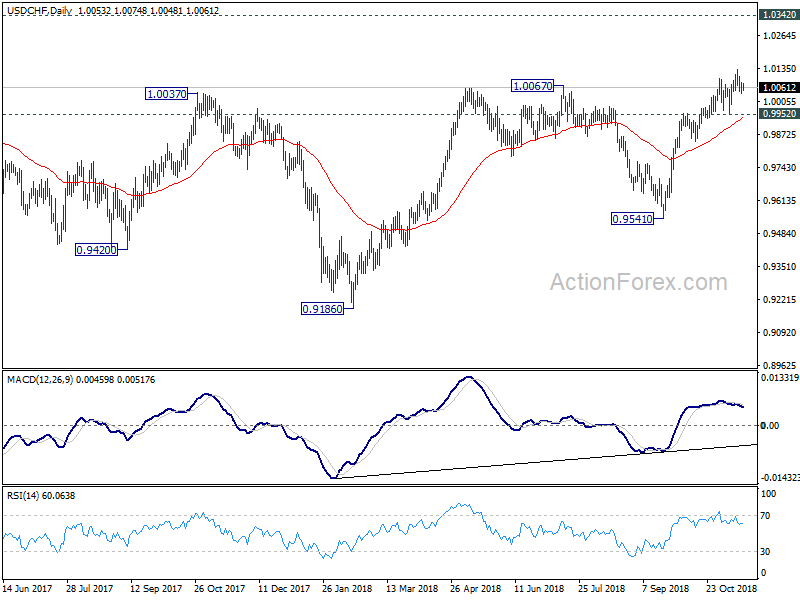 USD/CHF is staying below 0.9919 temporary top. Consolidation from there might extend and intraday bias stays neutral. . Deeper retreat could be seen after hitting 0.9900 fibonacci resistance. But downside should be contained above 0.9648 resistance turned support and bring another rally. Above 0.9919 will target 1.0037 resistance next. In the bigger picture, medium term decline from 1.0342 has completed with three waves down to 0.9186. Rise from there is currently viewed as a leg inside the long term range pattern. Hence, while further rally would be seen, we’d be cautious on strong resistance from 1.0342 to limit upside. For now, further rise is expected as long as 0.9648 resistance turned support holds, even in case of pull back. USD/CHF surges to as high as 0.9677 as rise from 0.9186 resumed. The break of 0.9626 key fibonacci resistance as more credence to the case of medium term reversal. Intraday bias stays on the upside and further rise should be seen to 0.9900 fibonacci level next. On the downside, break of 0.9576 minor support is needed to be the first sign of short term topping. Otherwise, outlook will remain bullish in case of retreat. 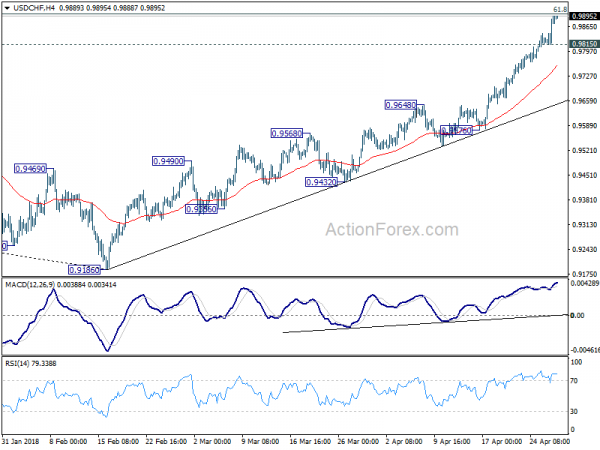 In the bigger picture, fall from 1.0342 is seen as a medium term down trend. The break of 38.2% retracement of 1.0342 (2016 high) to 0.9186 (2018 low) at 0.9626 suggests that it’s likely completed at 0.9186 already. Further rally would be seen back to 61.8% retracement at 0.9900 and above. Sustained break there would pave the way to retest 1.0342 key resistance next. 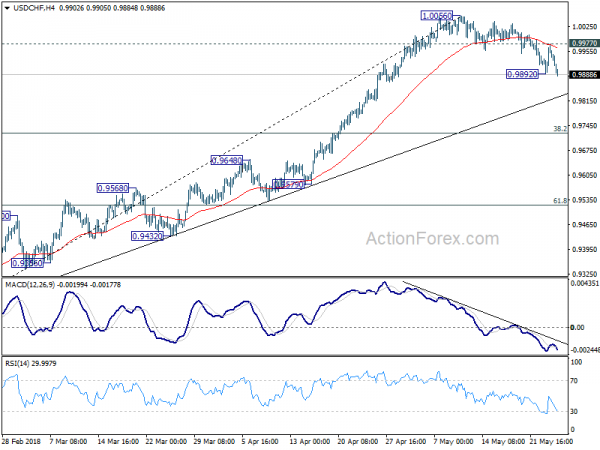 USD/CHF’s corrective fall from 1.0056 resumed today by breaking 0.9892. Intraday bias is back on the downside. 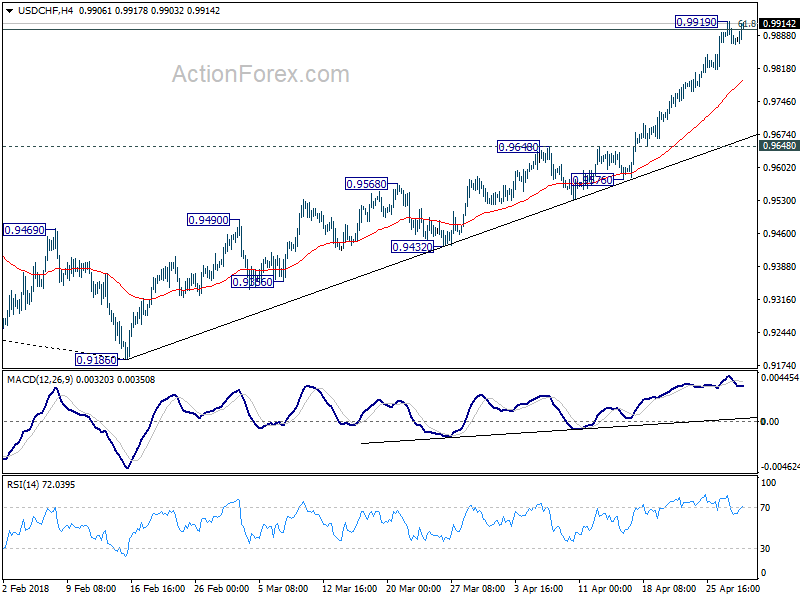 For now, we’d still expect strong support from trend line (now at 0.9825) to contain downside and bring rebound. On the upside, above 0.9977 will suggest that the pull back is finished and bring retest of 1.0056 high. In the bigger picture, medium term decline from 1.0342 has completed with three waves down to 0.9186. Rise from there is currently viewed as a leg inside the long term range pattern. Hence, while further rally would be seen, we’d be cautious on strong resistance from 1.0342 to limit upside. For now, further rise is expected as long as 38.2% retracement of 0.9186 to 1.0056 at 0.9724 holds. Daily Pivots: (S1) 0.9909; (P) 0.9944; (R1) 1.0012; More…. 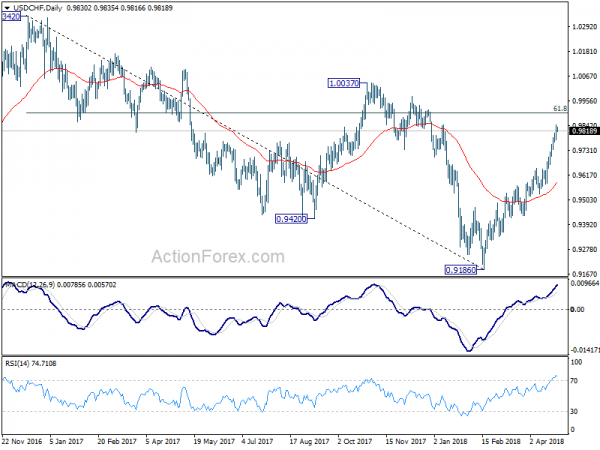 USD/CHF rally continues today and reaches as high as 0.9995 so far. 61.8% retracement of 1.0342 to 0.9420 at 0.9990 is already met. Intraday bias remains on the upside and sustained break of 0.9990 will pave the way to retest 1.0342 high. On the downside, below 0.9939 minor support will turn intraday bias neutral first. But outlook will remain bullish as long as 0.9736 support holds. 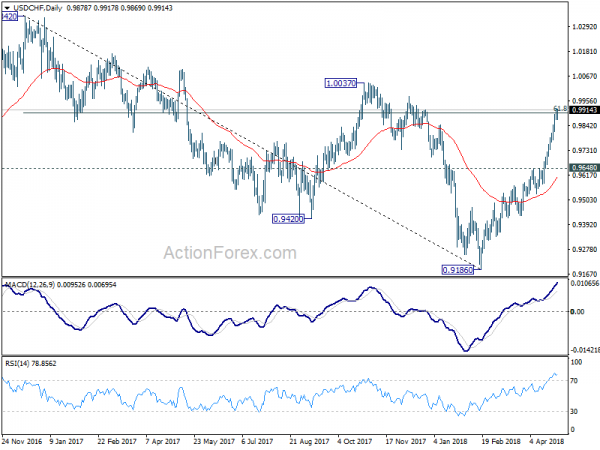 In the bigger picture, current development suggests that USD/CHF has defended 0.9443 (2016 low) key support level again. 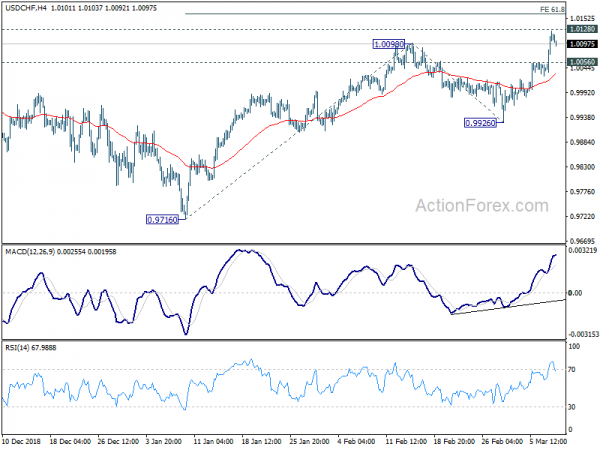 Rise from 0.9420 could develop into a medium term move and target a test on 1.0342 high. This represents the upper end of a long term range that started back in 2015. On the downside, break of 0.9736 support is now needed to indicate completion of the rise from 0.9420. Otherwise, further rally will remain in favor in medium term. Daily Pivots: (S1) 1.0053; (P) 1.0090; (R1) 1.0150; More…. USD/CHF rises to as high as 1.0124 so far. Intraday bias remains on the upside. Decisive break of 1.0128 will confirm resumption of rally from 0.9187. 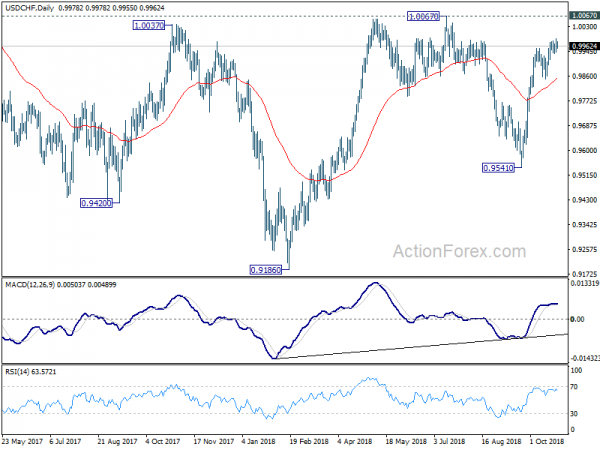 Next near term target will be 61.8% projection of 0.9716 to 1.0098 from 0.9926 at 1.0162 and then 100% projection at 1.0308. On the downside, break of 1.0056 minor support will turn intraday bias neutral first. Daily Pivots: (S1) 1.0006; (P) 1.0022; (R1) 1.0032; More…..
USD/CHF’s break of 1.0036 suggests that rise from 0.9812 has resumed. Intraday bias is turned back to the upside for 1.0619 resistance first. As noted before, corrective decline fall from 1.0342 should have finished with three waves down to 0.9812 already. Break of 1.0169 should confirm this bullish case and target a test on 1.0342 high. On the downside, below 1.0007 minor support will turn bias neutral and bring retreat before staging another rally. USD/CHF’s consolidation from 0.9551 is still in progress and intraday bias remains neutral. In case of another rise, upside should be limited by 0.9770 resistance and bring fall resumption. 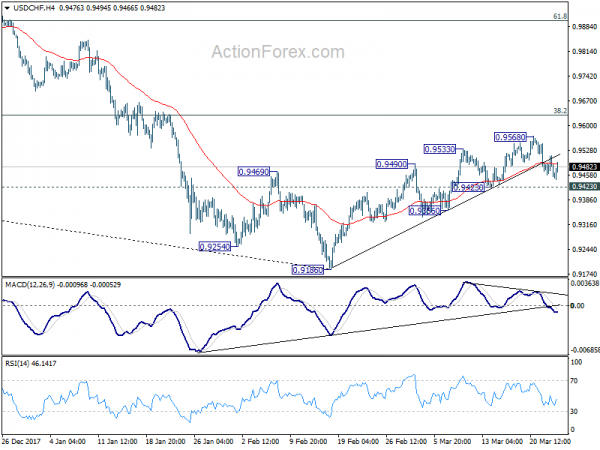 Break of 0.9551 will extend the whole fall from 1.0342 and target 0.9443 key support level next. We’d expect strong support from there to bring rebound. 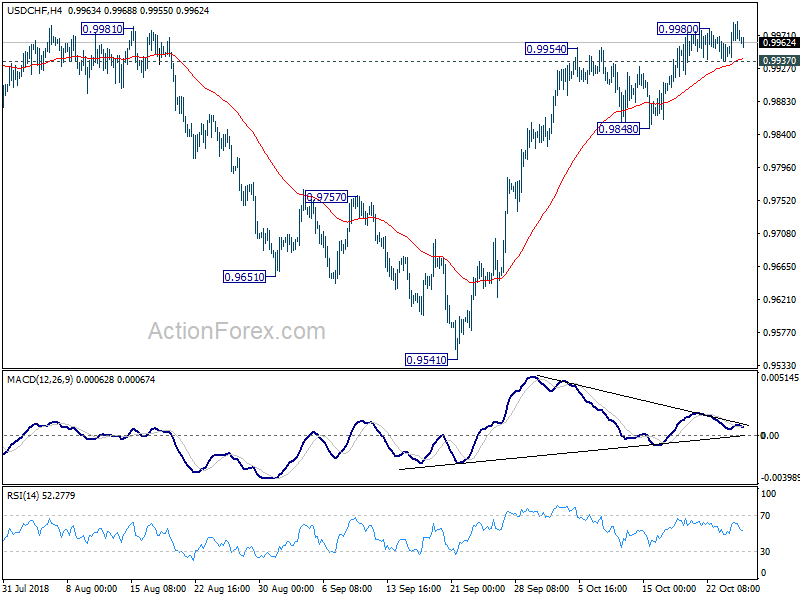 Meanwhile, firm break of 0.9770 will indicate near term reversal, on bullish convergence condition in 4 hour MACD.